Get a good night sleep with Valerian and wake up feeling fully refreshed. Valerian is a tall, wild plant with strong-scented flowers particularly liked by cats and dogs! Named after the Latin word valere, which means to be strong and healthy. Valerian is well known today as an aid to restful sleep. 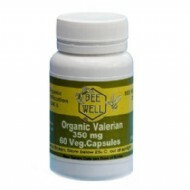 Each vegetable capsule contain 100% pure organic valerian root powder, no additives of any kind.